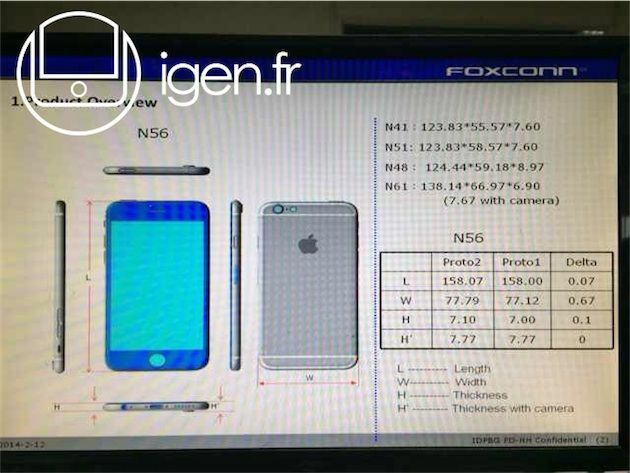 Foxconn factory employees have leaked the complete dimensions of the iPhone 6, according to iGen.fr, which posted photos of what appears to be Foxconn’s internal software listing the full dimensions for both the 5.5-inch and 4.7-inch iPhone 6. The two new phones, code named N56 and N61, are expected to be announced next month, and if the leaked specs are right, not only will the 5.5-inch iPhone have more screen than your iPhone 5s, it will also be 60% heavier. 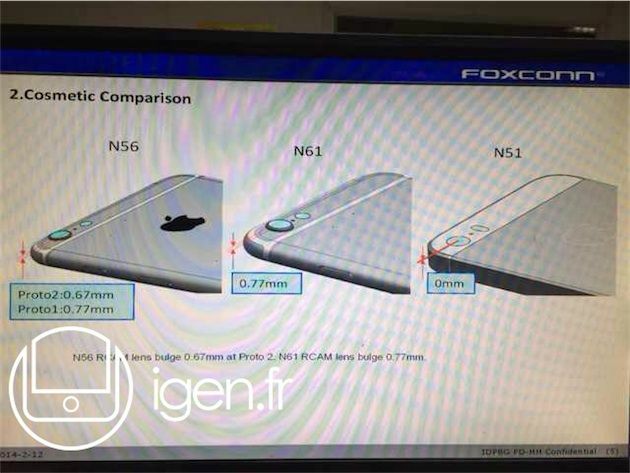 Based on the photos, the 5.5-inch iPhone 6 will measure 158mm long, 78 mm wide, 7.1 mm thick and weigh 184.6 grams (the iPhone 5s weighs 112 grams). There’s also information on a first prototype that had similar dimensions but weighed only 168.5 grams. Measurements for the 4.7-inch iPhone 6 are supposedly 138 mm long, 66 mm wide, and 6.9 mm thick. A weight isn’t listed for the device. Both devices feature a protruding camera lens like the one currently found on the iPod Touch. The 5.5-inch iPhone 6’s extra will come with the benefit of extra battery power, claims iGen.fr whose source says Apple plans to use a 2915 mAh capacity battery and a LiquidMetal Apple logo on the back. The site also claims Apple wanted to add a 2.5mm headphone jack to the iPhone 6, but decided to abort the plan due to fears of customer backlash.